(A) Non-credited mission that was aborted . Flight time 2 Hours 7 minutes Pilot was ill and CoPilot developed combat fatigue. 2Lt Henry McManus (P). Originally a Flight Officer. Promoted to 2nd Lt after mission #116 - 3 March 44). First mission #84 with an experienced Pilot. Completed combat tour on 18 April 1944. Before becoming a Pilot Henry McManus was stationed at Hickam Field, Hawaii and was a Pearl Harbor survivor. Was a member of the Hemet, CA class 43-D and a close friend of 359th BS Lt Vern Moncur. Remained in the USAF after WWII. Was a U-2 Pilot and was Commander of the 4080th Field Maintenance Squadron, Strategic Air Command. 2Lt Robert F. Bishop (CP). Substitute CoPilot on mission #87. Dispatched on sixteen missions with McManus crew. Last mission #115 on 2 March 44. Mission was aborted when Lt Bishop became sick. Later diagnosed as severe combat fatigue. Was relieved from combat mission status Crew utilized substitute CoPilots on their remaining twelve missions. 2Lt Victor T. Gorecki (A utility CoPilot and Tail Gunner/Observer) was CoPilot on seven mission - #116, 118, 119, 124, 125, 134 & 136. 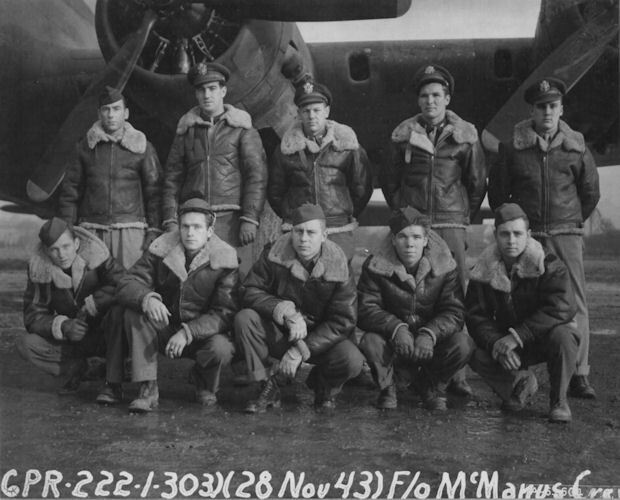 Lt Gorecki flew two missions with Lt Vern Moncur (#132 & 133) in B-17 Thunderbird and two other mission in Thunderbird with other Pilots (#140 & 152). 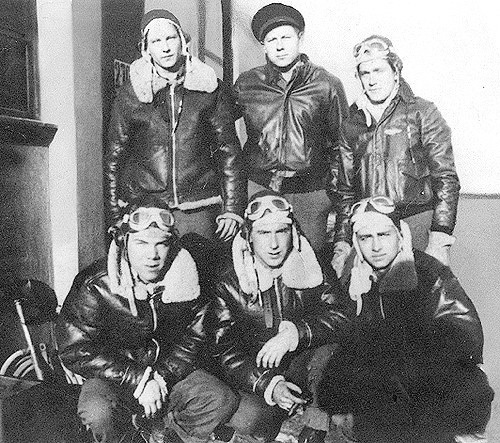 Appears in Lead Crew photos as Tail Gunner/Observer on missions 130, 143, 146, 159 & 164. Last mission #164-29 May 1944. 2Lt Charles P. Carroll (N). Also flew on mission #88 with another crew. Last mission on 18 April 1944. T/Sgt Robert P. Colburn (R). Did not fly on aborted mission #115. Last mission on 18 April 1944. S/Sgt Albert Doezema (RWG). Did not fly on mission #101. Flew two additional missions with other Pilots (#142 & 146). Last mission 07 May 1944. S/Sgt John W. Davies (BT). Did not fly on missions #98 and 101. Flew six additional missions with other Pilots (#141, 142, 143, 146, 150 & 151). Last mission on 11 May 1944.